A farmer has a field which is the shape of a trapezium as illustrated below. To increase his profits he wishes to grow two different crops. To do this he would like to divide the field into two trapeziums each of equal area. How could he do this? 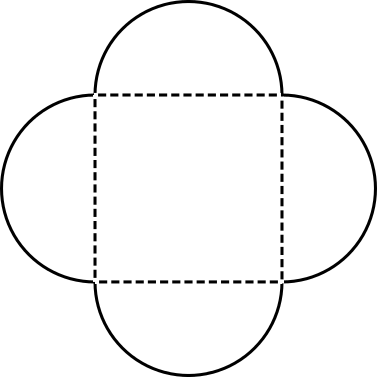 A square with perimeter 20 cm has a semicircle drawn onto each of its sides, as shown below. What is the perimeter of the new shape? Give your answer in terms of $\pi$.